Do You Use A DM Screen For Dungeons and Dragons? Last night at Dungeons and Dragons Encounters I had a player bring the new Fifth Edition DM Screen which I was able to use. That thing is absolutely beautiful! Feels very durable and I felt as though it had some very useful information on it. Too many times a DM Screen is packed with information you will never use or beyond the 1st or 2nd time you won't ever use again. I loved the low profile of it allowing me to see over the screen. Recently in video responses on YouTube many people have discussed their own thoughts on using DM Screens or not. I am surprised at how many people choose not to use any. For me I find them useful because I like to have all my miniatures hidden behind the screen especially the bigger encounters. Having the screen also allows me to keep my notes and maps hidden from the players. Players eyes will wander down and look in a lot of cases which can ruin some surprises. One of the greatest things about this hobby is the randomness and surprises of the game. Isn't that why we use dice? Speaking of dice I have seen a lot of people mention rolling in the open. When you roll dice in the open there is no denying that the players around the table begin to meta game. They will start figuring out the to hit bonus of the monster and things like that. I sometimes roll in the open and have noticed this happens all of the time. When I run D&D Encounters the players there seem to do it a lot more than my other groups. While that is fine I can't imagine as a player it would be fun knowing these things. Speaking of the 5e screen the things I would have liked to see on it would be XP for Leveling. The CR/XP by offense and defense of monsters from the DMG. Also quick rules on how to make an encounter with modifiers based on # of enemies and such. This would have helped with being able to run the game on the fly but it is still a very good screen. The highlights of the screen for me are the conditions because those will be used pretty frequently. I like the name generator, NPC generators, and random things on the far right section of the screen like random events. If you run games primarily online there is no need to use a screen but if you run games in person I highly recommend it for the reasons above. 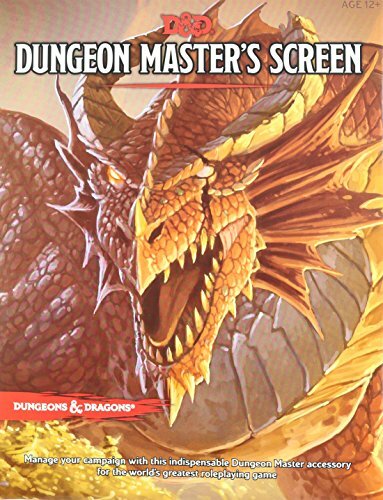 I will be picking up my own 5e screen very soon because it is really well done I think. Even though I feel they could have added more to really make it great this screen is one I could see myself using for other games even. The system neutral things are the main reason for that. Hope you liked this post. Please check out and follow me on my YouTube Channel, Twitter, Facebook, and G+.